Who doesn’t love Fridays? 😀 I know I love Fridays for so many reasons…weekend is here, we get to spend lots of time as family, creating memories, and we always always love to have our Papa home with all day on Satudays & Sundays. We love to drive around with top-off-Jeep on pretty sunny days. So we hope that tomorrow will be a sunny one. I found this cute scooter from Silhouette Online Store designed by Lori Whitlock. Cardstocks I used for the scooter are Black (from Basic Combo), Sky (from Whimsy Combo), Lagoon (from Adventure Combo), White Daisy. I cut the shapes with my Silhouette Cameo, all at once. Before I put them together, I stamped the diagonal stripes from In The Background (D1540) with Sky Exclusive Inks Stamp Pad (Z2194) on the layer of the scooter. I put them together using the glue pen. On a White Daisy Card (X254), randomly I stamped the clouds from Lifting Spirits set (C1570) with Sky Exclusive Inks Stamp Pad (Z2194). The banner I picked from one of the banners from Lifting Spirits set (C1570) and stamped it with Black Exclusive Inks Stamp Pad (Z2105). The sentiment on the banner is from Give A Lift (D1581) which I stamped with Ruby Exclusive Inks Stamp Pad (Z2170). I used the Piercing Tool Kit (Z1114) to poke the holes on the back of the scooter and the edge of the banner to tie up the thread. I added everything on the card using 3D Foam Tape (Z1151) for extra dimensional. That scooter is ADORABLE. Such a fun card Helen! Hi Helen, I’ve made it to your blog at last! 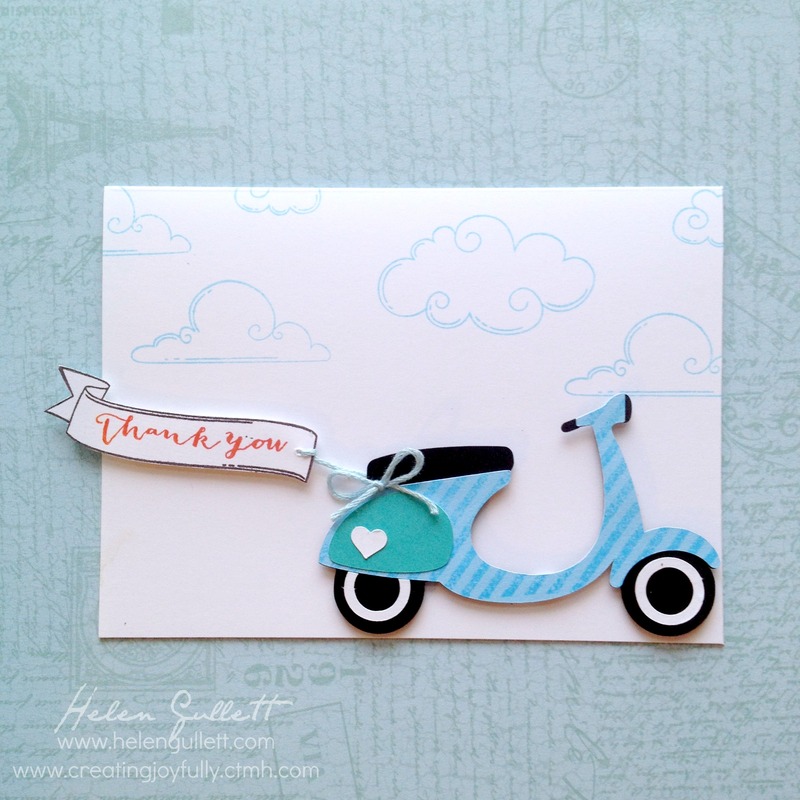 Your card is adorable….. love the scooter, its just fabulous! Hi Tracey 🙂 So glad you visiting! Oh, this is so sweet! I love that little scooter! This is so cute, Helen!